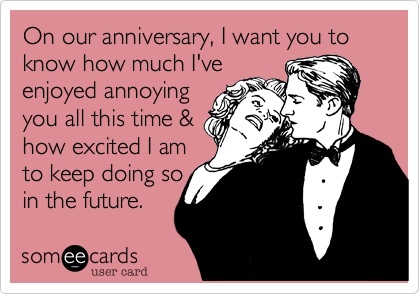 Happy Anniversary babe! We made it through another wonderful year together. Hard to believe it’s been 4 years already, but time flies when you’re chasing a toddler around the house most of the day. Can’t image how things would be without you. I love all the time we spend together and how well we get along. Can’t thank you enough for everything you do for the family. Love you more than I can express. Here’s to another year of happiness!